Handcrafted, unique, wooden furniture and art for your home. I use bittersweet vines to create most of the pieces you see here. 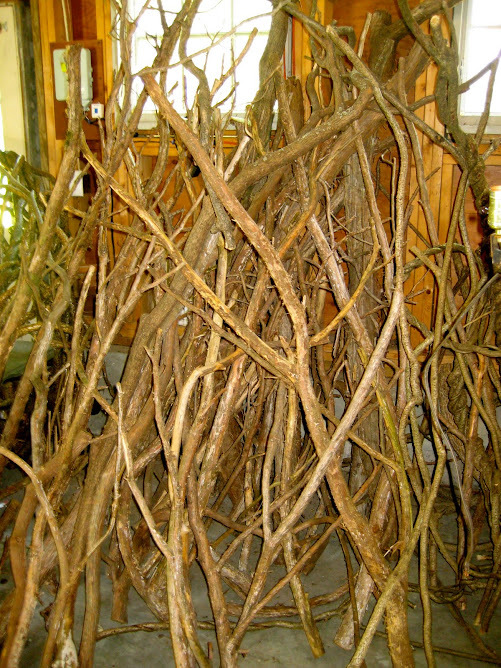 Bittersweet is an invasive vine that is destroying New England forests. I have permits from local towns and conservation groups to remove this vine in an ecological way. I use only mature vines and never disturb the berries (which could further spread these vines). Visit www.entangledfurnishings.com to see the pieces I offer for sale. 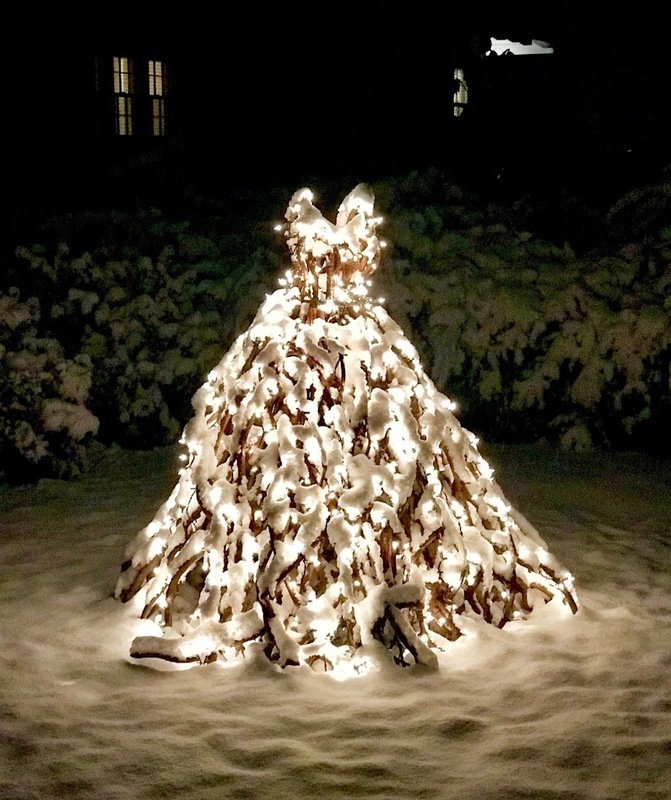 My dress sculpture made with bittersweet and steel makes a beautiful and unique winter display with tiny white lights and snow. 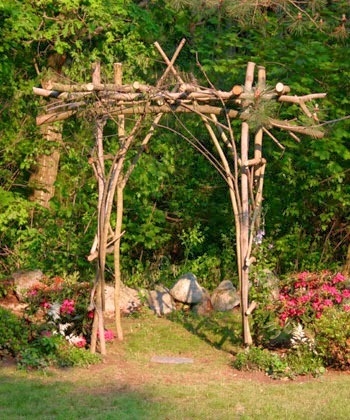 The vines for this arbor were collected with permits from local conservation lands. 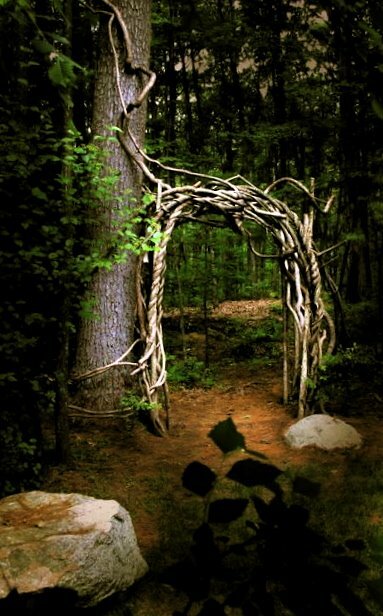 This is a unique and beautiful doorway inviting you into another world. These hand made chairs are made using alder, maple, red osier dog wood and bittersweet. They are more throne than chair, a seat where Gandalf might rest. I make chairs from alder, maple, bittersweet, wisteria, red osier dogwood and willow. I have found that careful attention to the internal dimensions of the chair (the height and span of the arms and the curvature of the back) results in a chair that welcomes and engulfs the sitter. The challenge of fitting many different pieces together in just the right way requires many labor intensive hours. These chairs work well inside or on a covered porch. 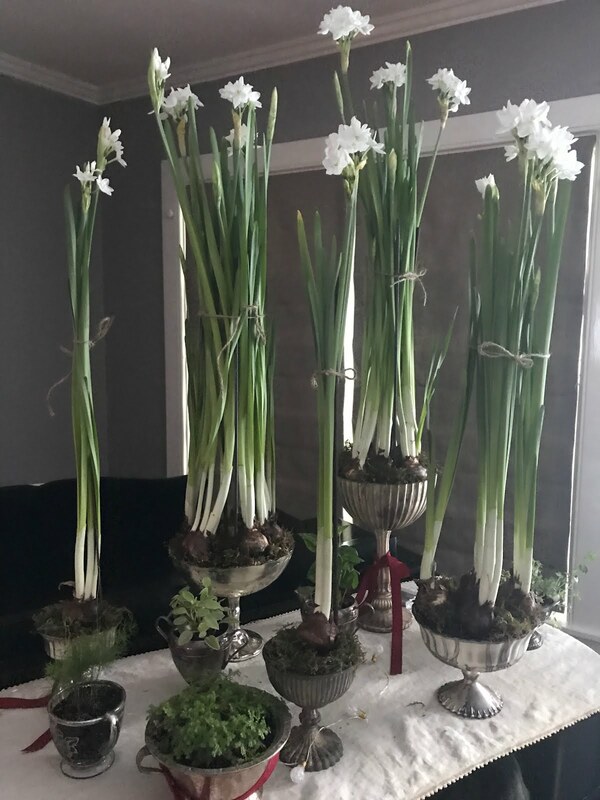 I created this centerpiece using some of my favorite things. 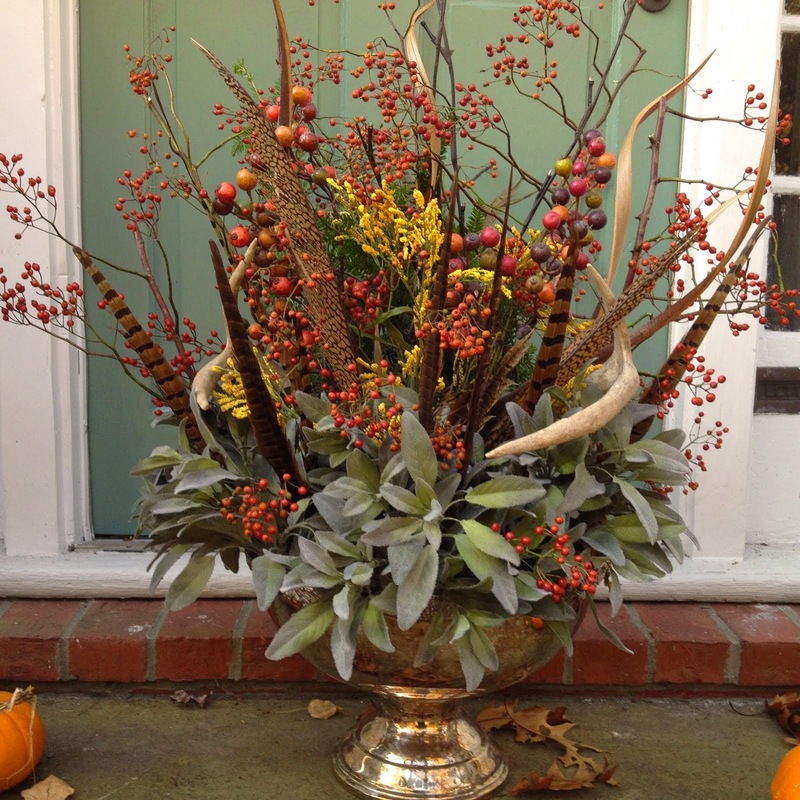 Rose hips, sage leaves, winter berries, twigs, antler sheds and an old horse bridle. The silver punch bowl lends a touch of elegagance. These hand made chairs make a wonderful place to rest. A beautiful handcrafted side table made of bittersweet vines and bluestone. 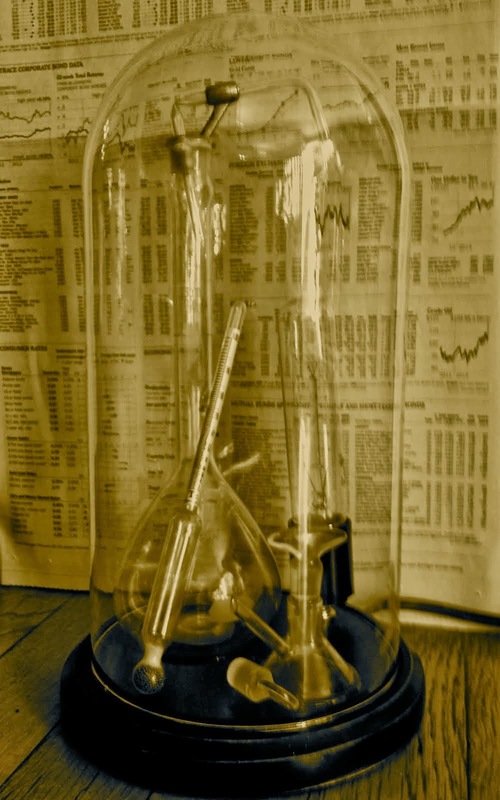 This composition of 1940's laboratory glass includes an antique replica light bulb. 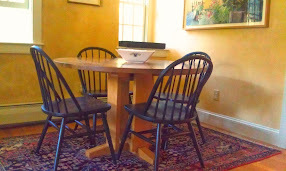 My website www.entangledfurnishings.com finally launched today. Check it out! Each wreath is a unique, and hand crafted. 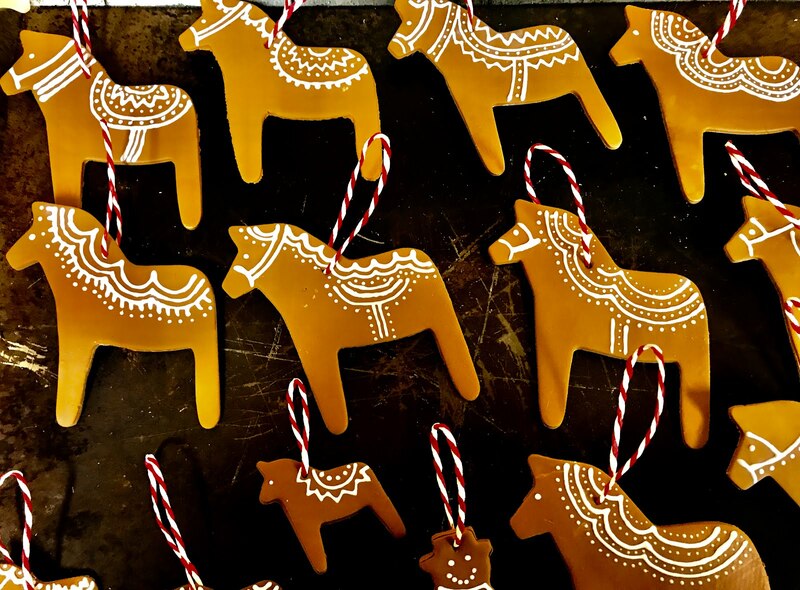 They are made from bittersweet vines culled from conservation land. I do not disturb the berries, to prevent further spread of this invasive species. I have town permits to collect the vines I gather. Removing bittersweet saves trees and helps preserve and protect native New England forests. 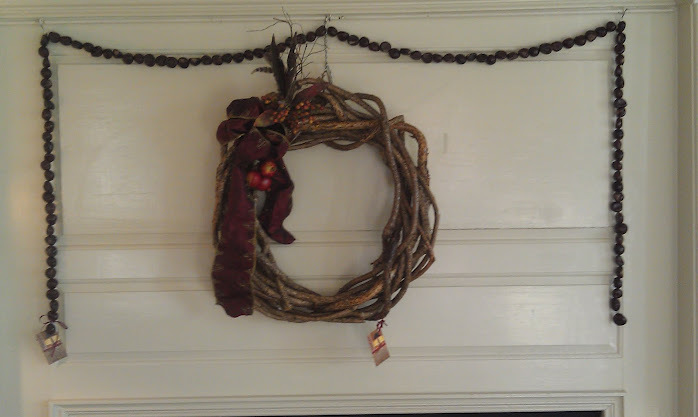 This wreath is decorated with winter berries. Bittersweet wreath, horse chestnut garland, vintage maple sap buckets with antique French labels I collected the horse chestnuts, drilled holes through them and strung them together with copper wire. The buckets are old maple sap collecting buckets, I decoupaged old French lables onto them for a little interest. 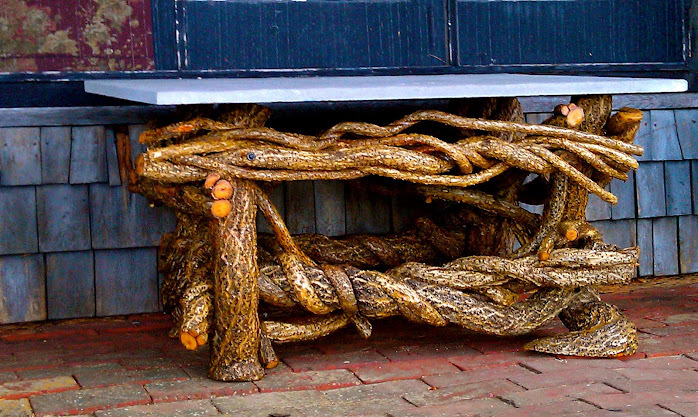 A unique forest like sculpture of twisted vines, roots and stone, provides a magic corner in your home for imagination. I use unusually shaped granite for the lamp base. To this granite I anchor the body of the lamp, which is two or three small pieces of pin cherry cut from saplings. Pin cherry bark is a deep burgundy and is accentuated by pale yellow striations. I make each lamp shade, often with a pale paper into which is embedded the body of leaves. I use small pin cherry branches to fashion the finial for each lamp. I chose a black shade for this lamp which lends an elegance to the piece. I finish each lamp with three coats of satin marine spar varnish, which gives a permanent luster to the bark. 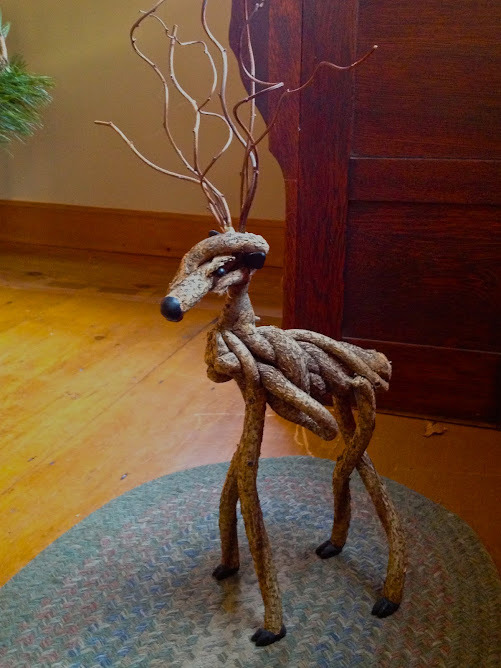 A cute, ungainly reindeer. He just makes me smile. 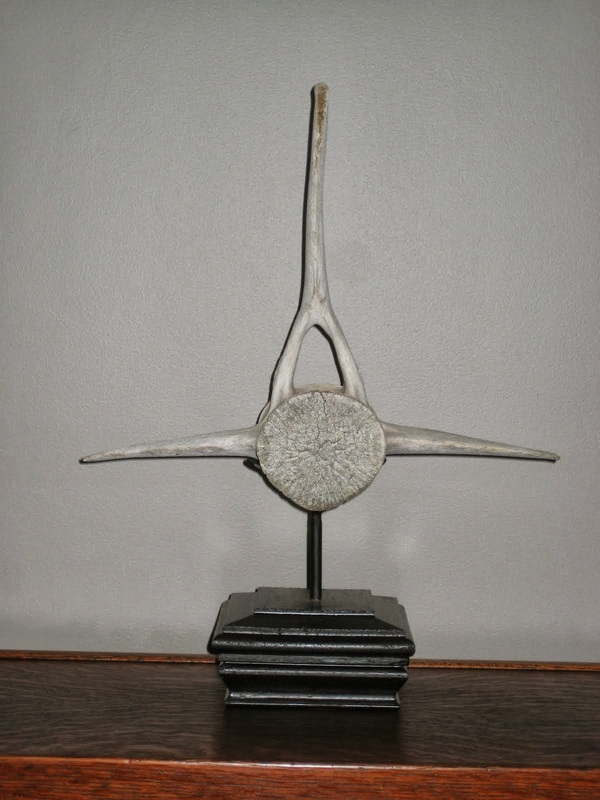 This is a unique and functional piece for any hall. An enormous enchanted piece for any room. This ancient rhododendron was dried for two years and then turned into this table. The top is a natural edge stone of a deep coffee color. This bench is created from lake driftwood. The pieces were chosen for their color variation and interest. The seat is bluestone. This would be beautiful at a beach house. 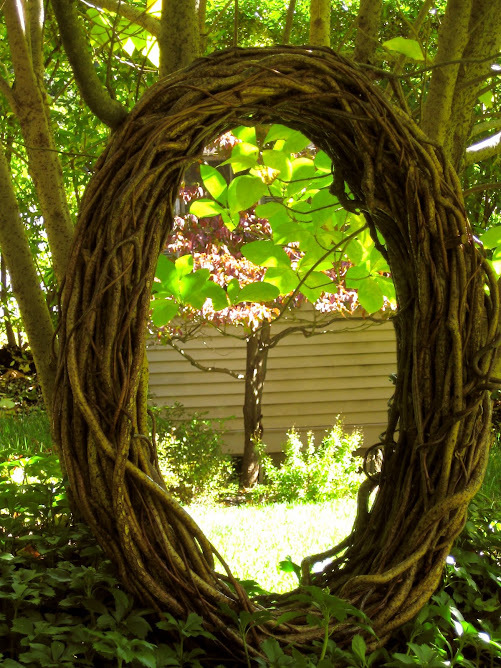 This arbor was created to delineate a manicured garden from the wild beyond, a perfect gateway through which hobits or the like might travel. 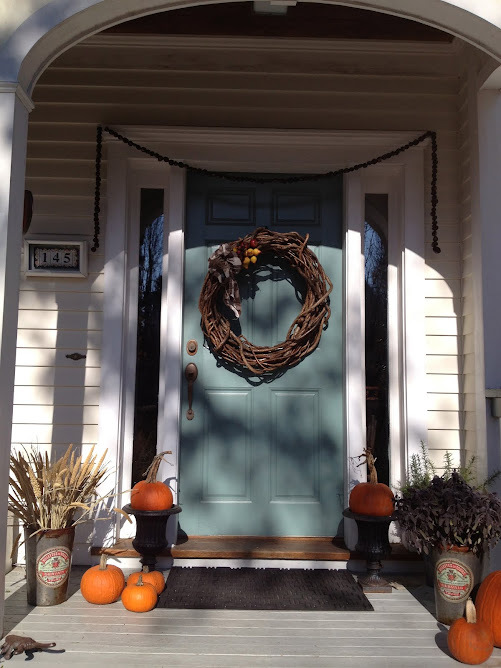 The owner decorates it with holiday lights, and it is a beautiful winter as well as summer focal point. Here is the June 14th Globe Home Magazine Article about my furniture. Just click on the photograph to read the article. 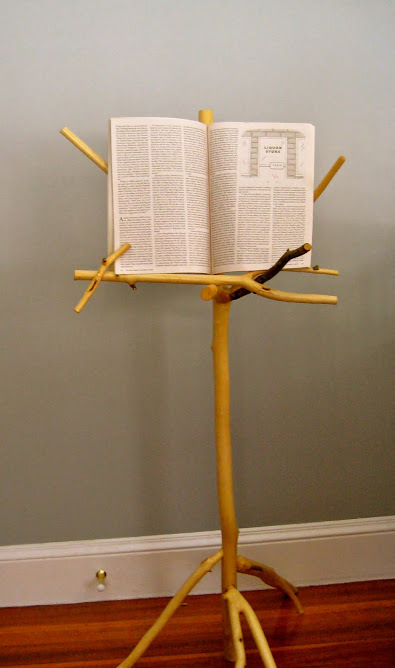 Music Stand I made for my son Thomas. He is a wonderful musician. A place to set down a drink while you soak up the sun. Mini pumpkins and embroidered signatures. I enlarged my children's signatures 400% and embroidered them on linen dinner napkins. I made these using two colors of polymer clay. Then liquid sculpy was piped on for the decorative design. 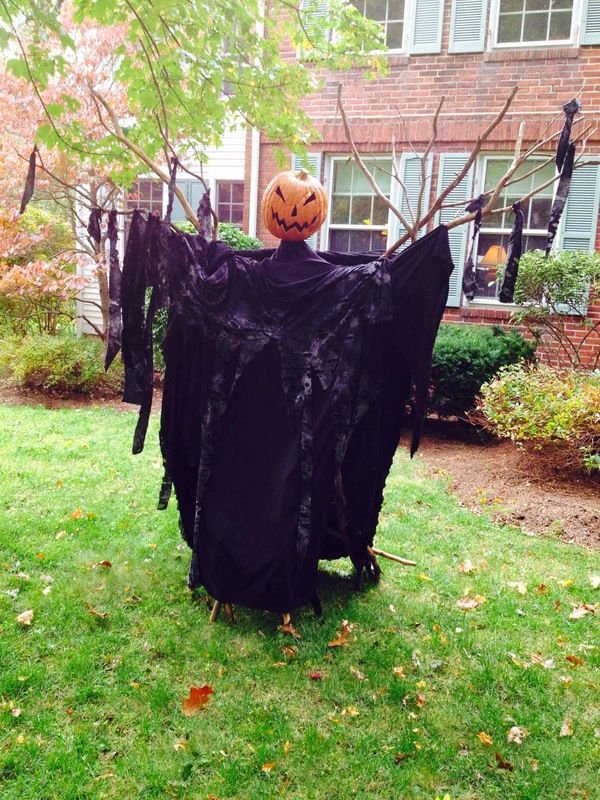 Haloween 2013 I made this guy from cedar branches. It's a tribute to Tim Burtons exhibit at MOMA a few years ago. My latest bench is on display at this amazing gallery and sculpture garden. It's perfectly located on a horse farm in Concord, NH. Make the trip it's well worth it. 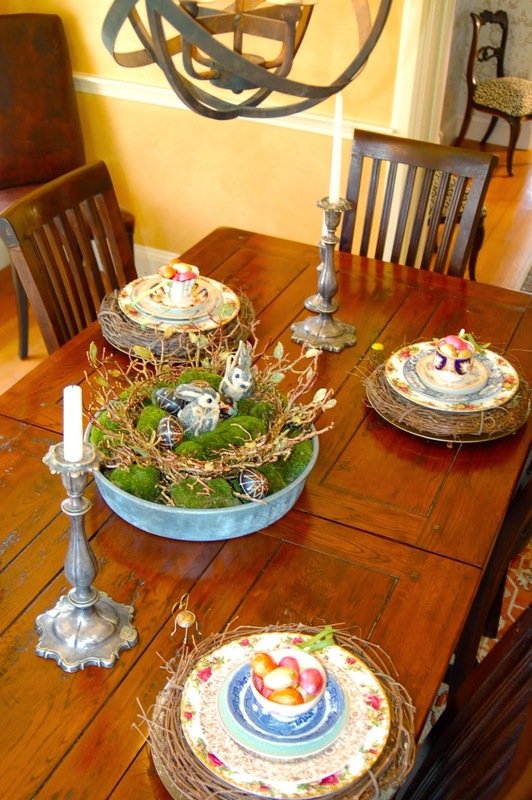 Vine chargers, mismatched plates and a moss filled centerpiece create a beautiful Easter table. 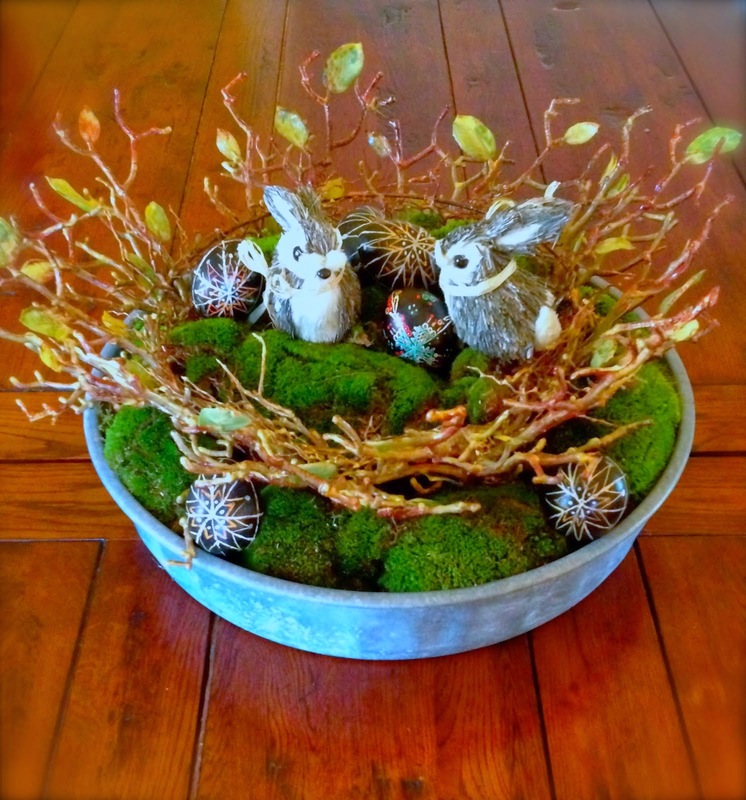 Galvanized metal, moss, twigs, easter eggs and rabbits, make a delightful spring centerpiece for your table. 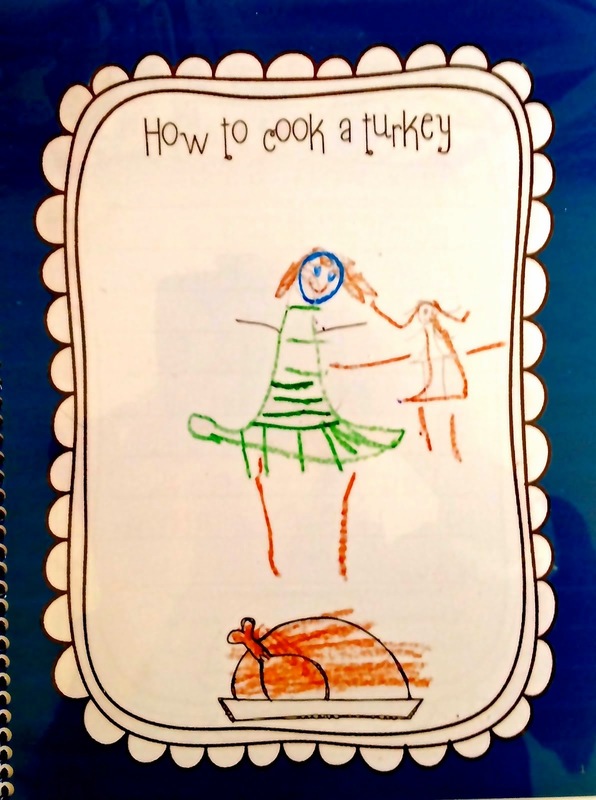 I compiled my Thanksgiving recipes into this 23 page cookbook, hoping that my descendants, who I will not know, will enjoy Thanksgiving dinners like the ones I create for my family. A beautiful, interesting, coffee table display One of my many tracking finds. 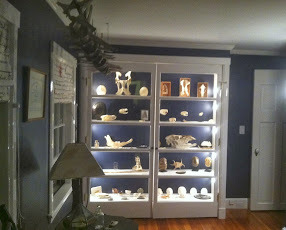 I turned an old hallway into a small museum room. It added a whole new life to an otherwise uninteresting part of the house. I had an idea to coat tiny bones in silver and make necklaces with them. My friend and jeweler, Hillary Taylor (Merlin's Silver Star Jewelry in Concord, MA), coated these with a silver polymer clay and fired them in her kiln. They are beautiful and such a conversation piece. 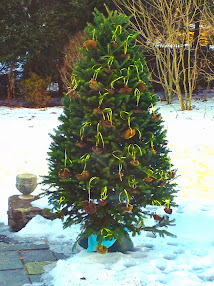 Instead of disposing of your Christmas tree, turn it into a bird feeder. This one is decorated with sunflowers from my neighbors garden. I dried them in my oven in October, just to tie on this tree. I placed the tree where we could all see it and enjoy its new life. A close up of the dried sunflowers. Last year I used pine cones rolled in peanut butter and bird seed, but the dog kept retrieving them and bringing them back in the house. 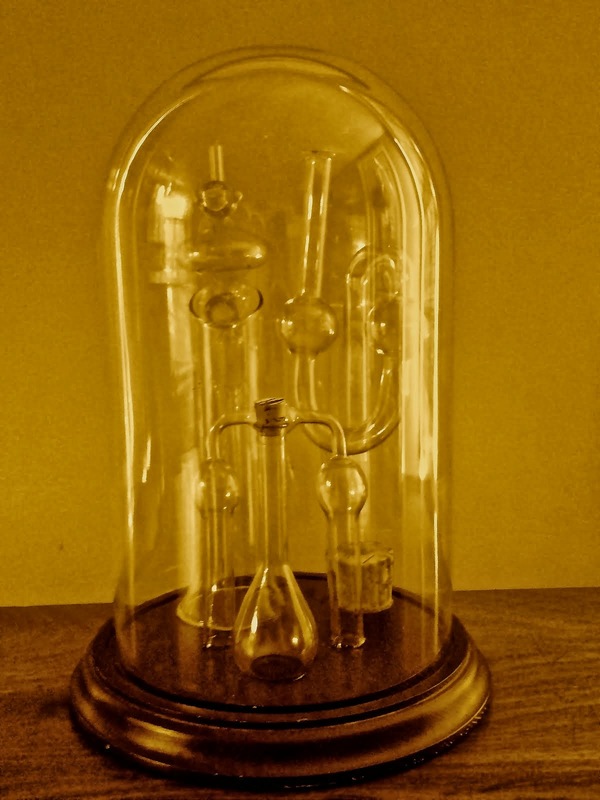 Vintage laboratory glass artisticly displayed in a cloche jar. I enlarged my children's signatures and embroidered them onto pink linen napkins. We use them at family gatherings. So special. 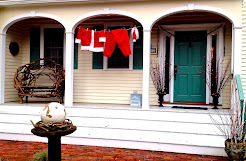 The neighbor's children believe I am Santa's laundress. The suit will be taken down on Christmas Eve. All clean for the busy day ahead. Christmas 2011 The entire structure is edible. 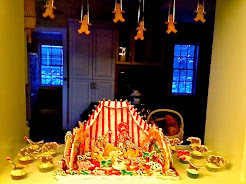 Every New Year's Eve, the children smash and eat the gingerbread. 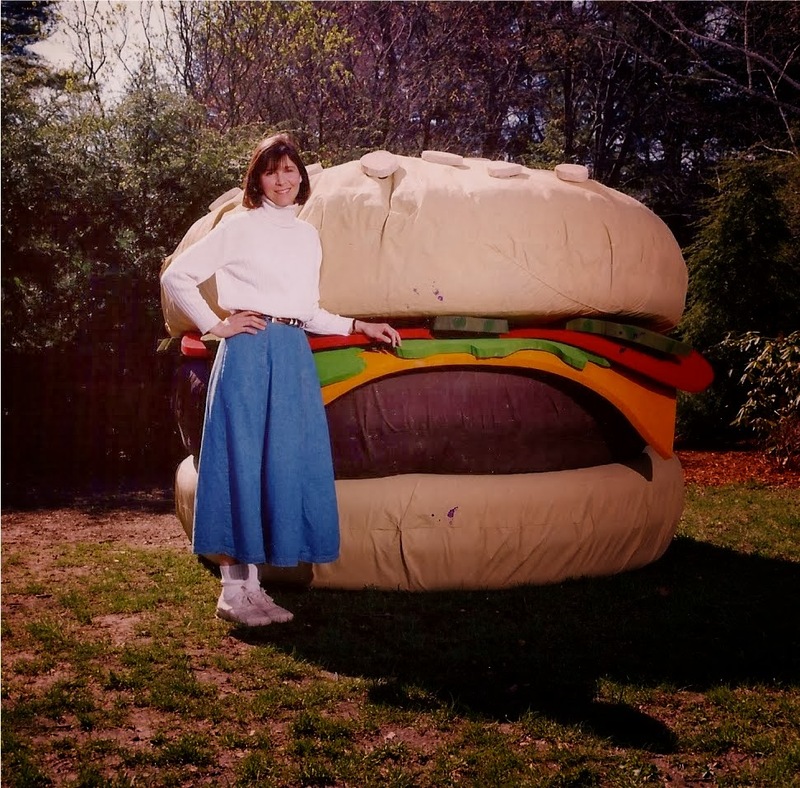 I sewed this giant cheeseburger in my garage. I used painters drop cloths, huge foam sheets, inflatable kiddie pools and lots of paint. It took 2 months to complete. The Greatest Show on Earth. 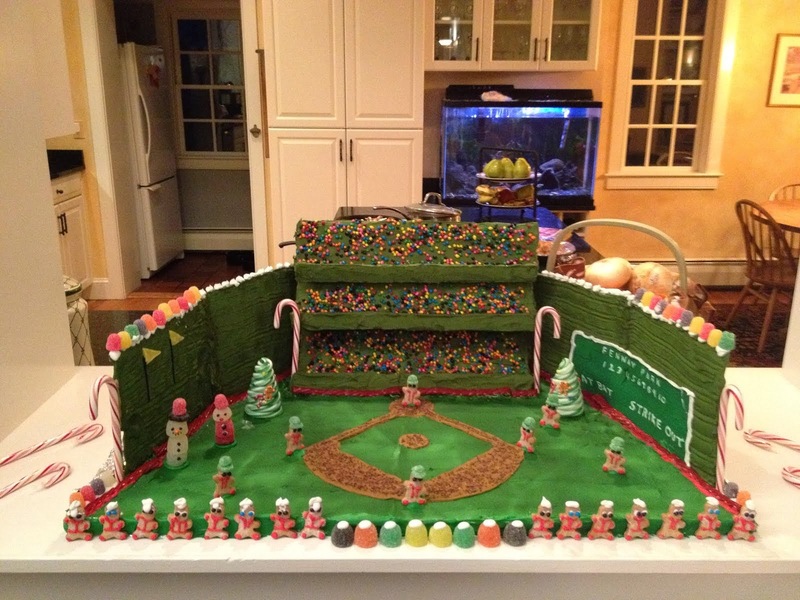 This entire set up is edible. The trapeze artists made a surprise entrance. Jumbo the elephant appears many time here as a tribute to Tufts University. 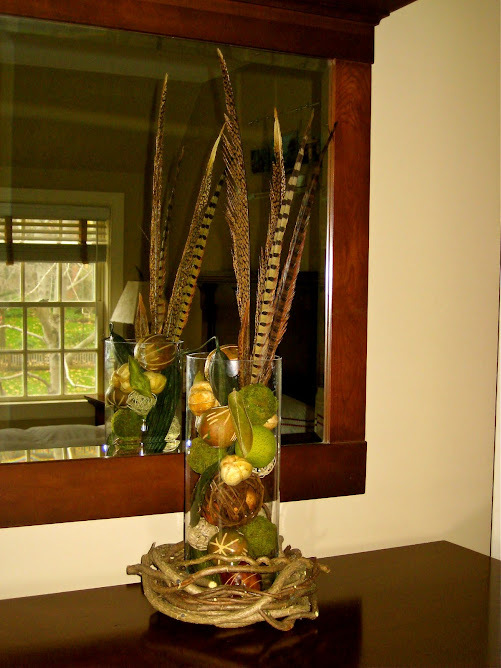 This is a great project for the family to make Thanksgiving weekend. 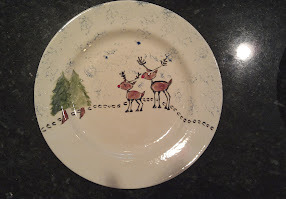 The dishes are fired and ready to use on Christmas. I have an entire set of dishes created in this way. Because I am an animal tracker, I simply could not help myself. The heads and bodies of the deer are made from impressions of my grand children's thumbs. 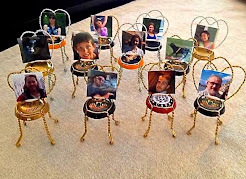 These chairs make great place card holders. Each chair pictured here has a photo of family members, dog and cat included of course. I made them from the cages on top of champagne bottles. My son, Thomas, worked at this amazing art deco theater in Oakland, CA for 4 years. 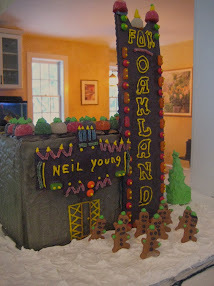 I saw Neil Young perform there. 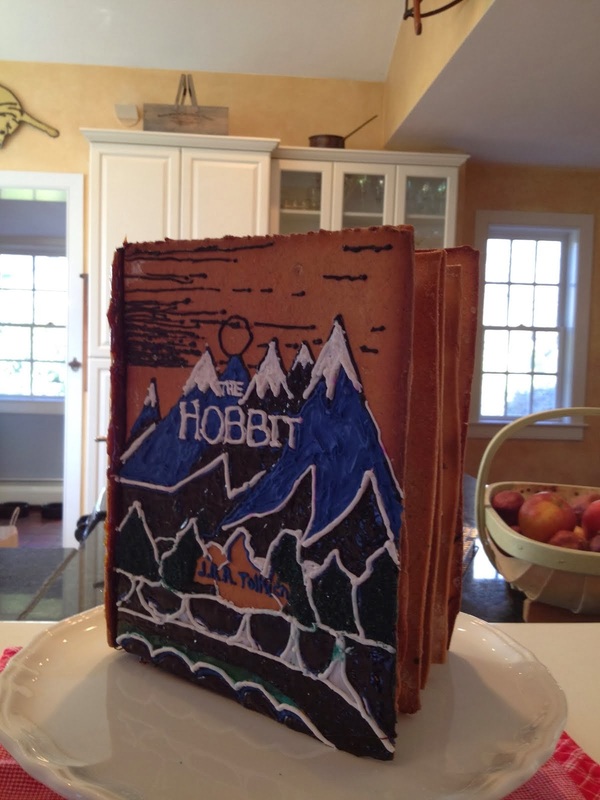 After that I just had to make the theater in gingerbread! Two of my children attended Cornell University. This clock towe (McGraw Tower) is the center of campus. Built in 1770 for patriot minister William Emerson, The Old Manse, a National Historic Landmark, became the center of Concord’s political, literary, and social revolutions over the course of the next century. In the mid-19th-century, leading Transcendentalists such as Bronson Alcott, Henry David Thoreau, and Margaret Fuller discussed the issues of the day here, with the Hawthorne and Ripley families. My children and I spent many happy hours playing on this property. A family cookbook "We all Live in a Broccoli Tree"
While I was recuperating from being hit by a speeding motorcycle (while standing in a store in Romania), I compiled this cook book. I scanned old recipe cards from relatives, which brought back memories. The title came from a song I used to sing to my children to encourage them to eat broccoli. It was sung to the tune of "Yellow Submarine". Boy were the children upset when they heard the beatles sing it. Each family member (with some noted exceptions) painted a tile one Thanksgiving weekend. Here is the beautiful tray made from those tiles. On my tracking forays I often find animal bones. Iput them in cigar boxes to create this display on my wall. I used to call Sarah "miss malaprop" when she was little. 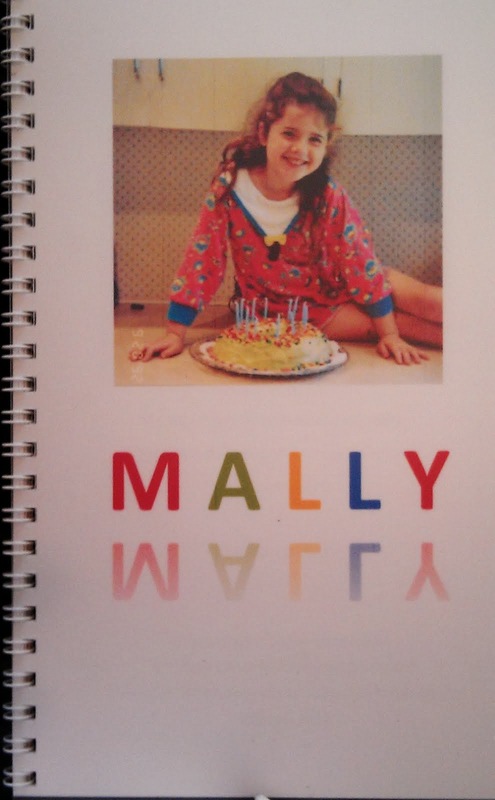 This book is a tribute to that little girl and a trip down memory lane recalling her hilarious misteps in language acquisition. 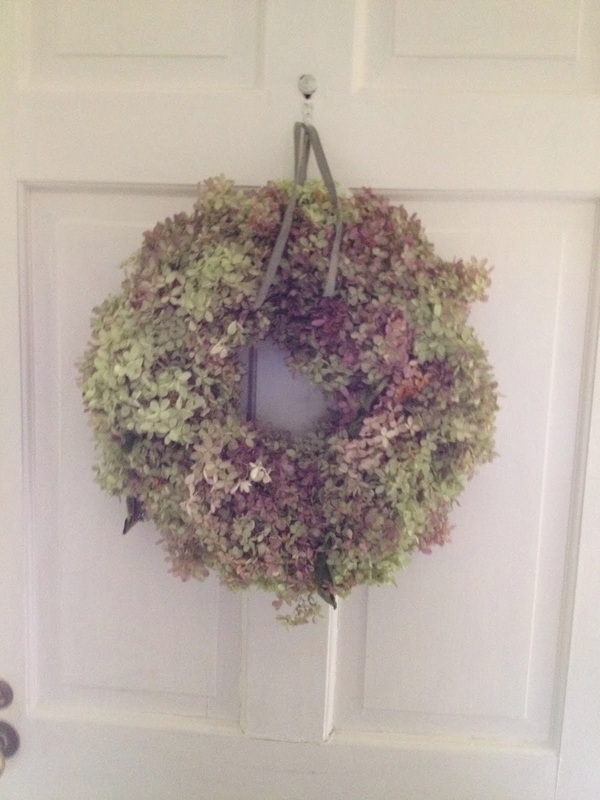 I make these beautiful wreaths every fall My neighbor lets me pick the flowers from her tree. 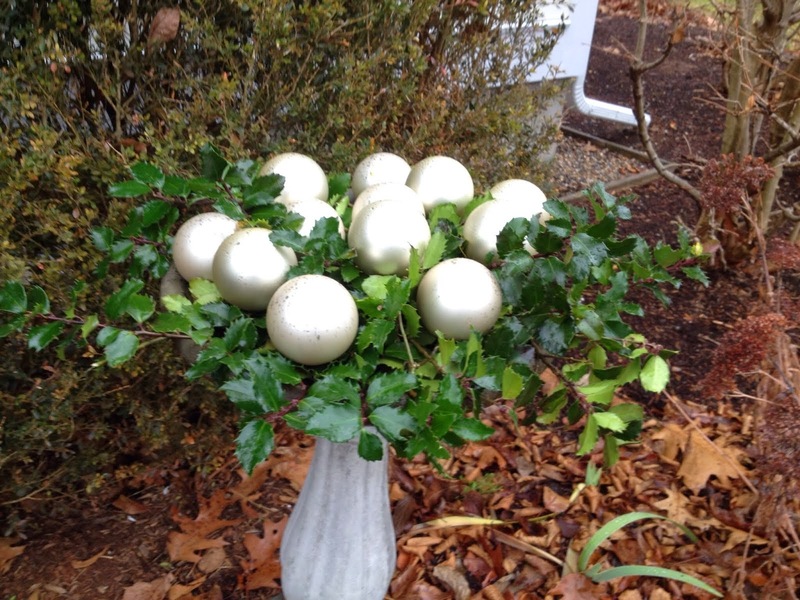 I pin them to straw wreaths and spray with hair spray to preserve the color. 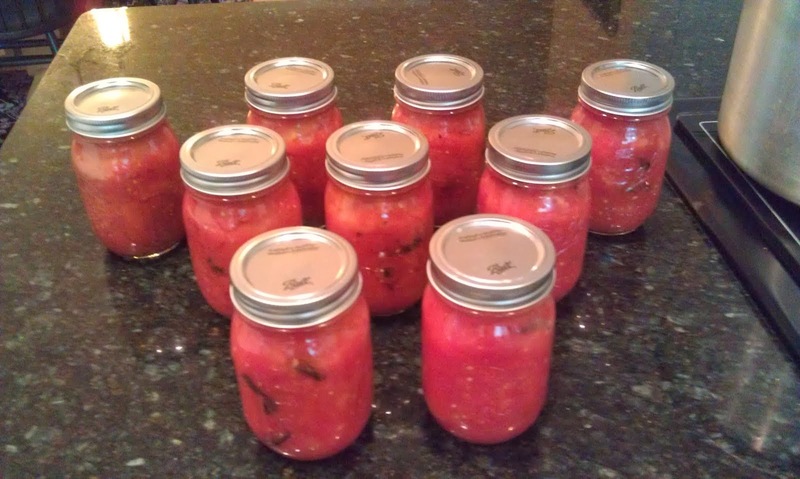 Every fall I pick and can tomatoes. All winter and spring I'm so happy I did this. I used Prisma colored pencils to create these. Karen Cadenhead taught me this technique. Slightly dangerous. 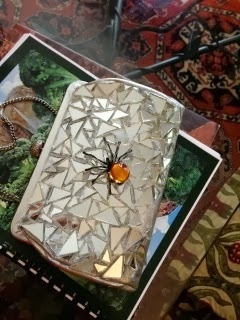 I used an old silver purse and epoxied broken mirrors onto it for this cool effect. Fresh greens, and fruit wired to a piece of cedar, create a beautiful living bird feeder. My friend Lynne Smithwood taught me this. 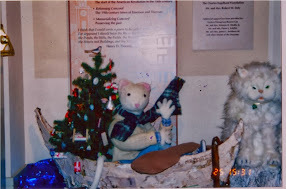 This is another Chrisstmas display I created for the Concord Museum. Uner the wolf mask is the body of Stuart Little! 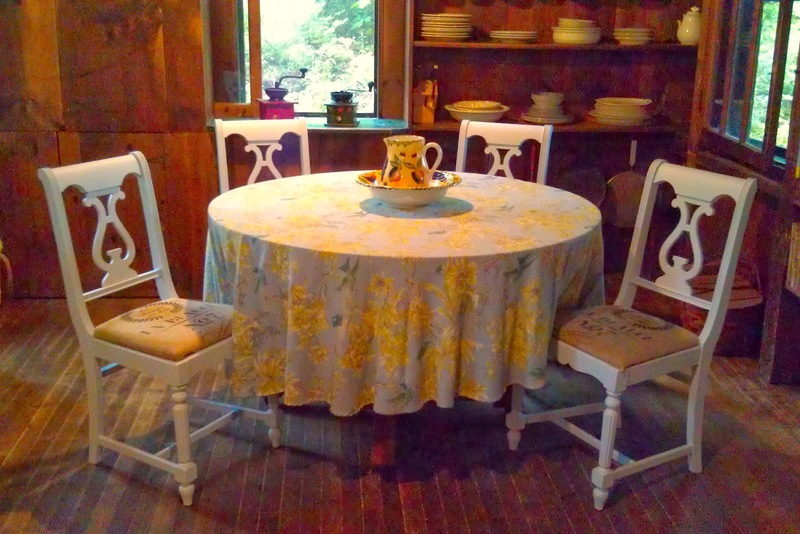 I painted these old chairs with a pale blue chalk paint and covered the seats in old French grain sacks. I am in a competition with my son-in-law to see who makes the best cheese cake. This is my entry. 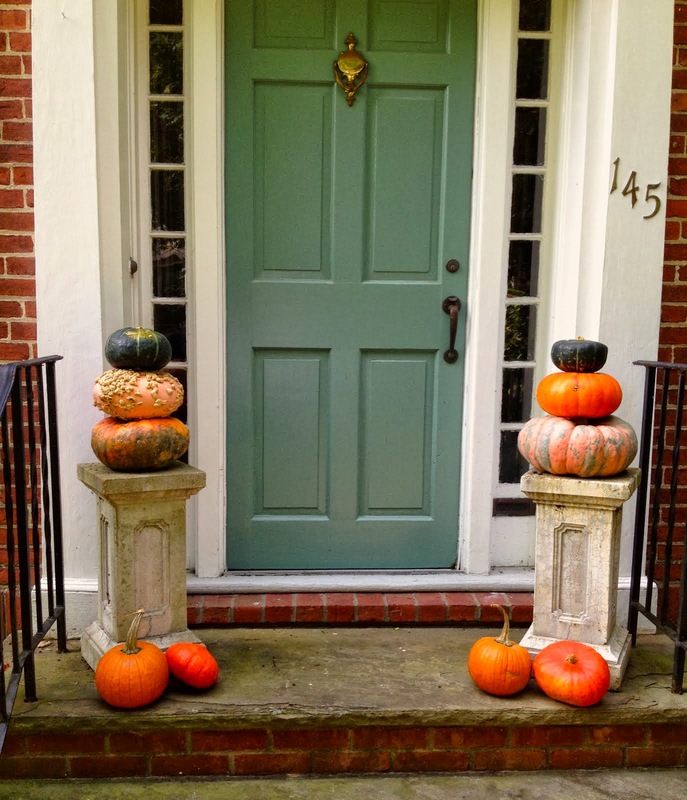 A beautiful arrangement of pumpkins and squash. 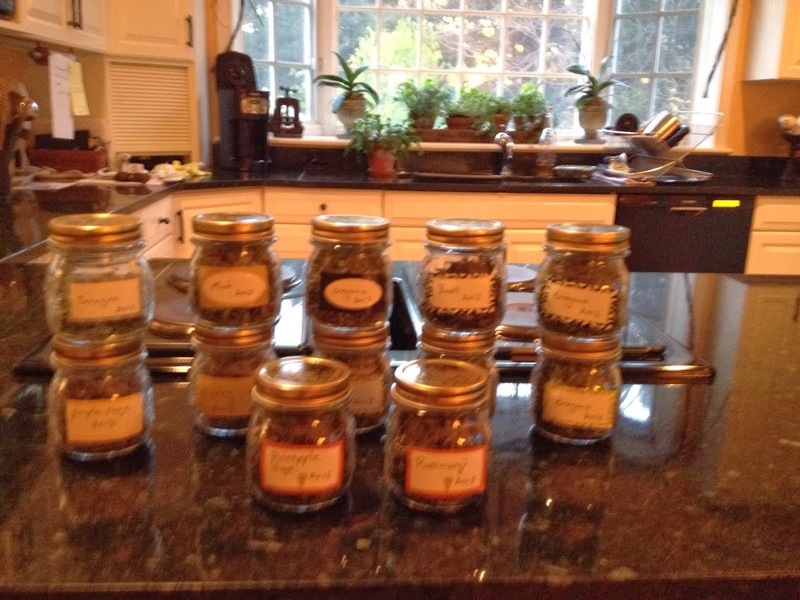 A rustic display of the fall harvest. This bench would be beautiful in any garden setting. It is made from invasive bittersweet and fitted with a bluestone seat. It is whimsical, charming and fun! This is beautiful alone or in a cluster of three with graduated heights. I made a birch bark canoe, and Stuart Little for the Concord Museum's annual Tree exhibit. 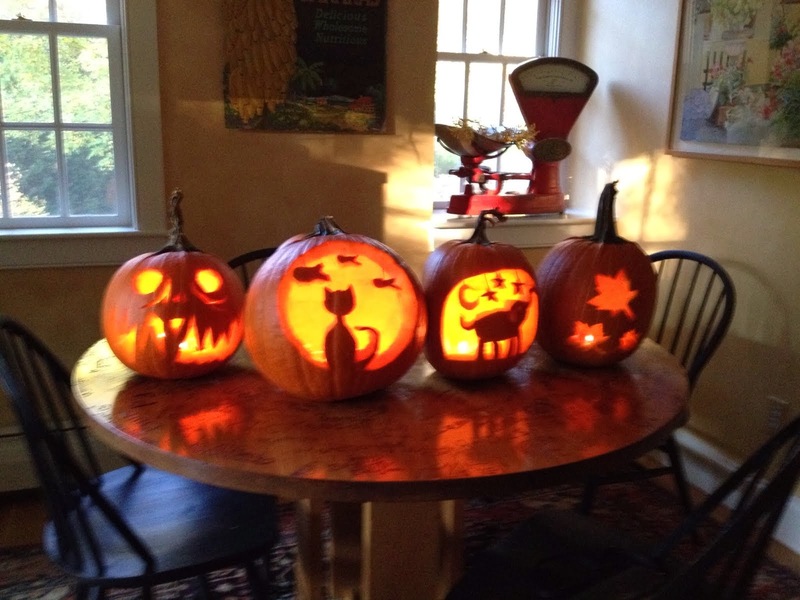 My friend Jean Scanlon made the cat. These worn out old chairs were a natural ash color. I painted them black, which gave them a new life and dramatic look. The deep appreciation for the beauty of wood and stone that drives my current work is a mature version of the joy and sense of mystery I felt as a child when I played in the woods. Each chair, table, bench or arbor that I create is one of a kind, just as the trees and vines themselves are unique. While each piece is different, I begin each in the same way: I go into the woods. I spend hours looking for the right vines and branches of the proper species with the shape, color and texture that will permit me to construct the object that is forming in my mind. I wrestle bittersweet from the trees it has engulfed. I climb high into the trees with my pole saw. It seems the most interesting vine grow at the very tops of the trees. I fight poison ivy, black flies, and mosquitos all while trying to keep my balance. Mostly it works. I drag my finds to my Ford pick up (usually this is a mile or so through thick woods) with ungainly vines catching on everything conceivable on the way out. I transport them home, unload, and get to know my new materials. The pieces come together, sometimes quickly, but more often it is a slow process. Eventually a piece is created. I go through the same process with stone. For each chunk of granite or slab of bluestone I must respond to a particular color, shape and texture. I spend long summer hours choosing the right stones or at the stoneyard picking through dozens of quarried slabs of bluestone. I chisel some of the bluestone so it has the natural edge I'm looking for. Other creations are made with my interpretation of found objects. Vintage laboratory glass, and animal bones are among the things I work with. Click on the photo to read the article. My Art, "Bittersweet but Beautiful"
I made these garlands from horse chestnuts and strung them on copper wire. 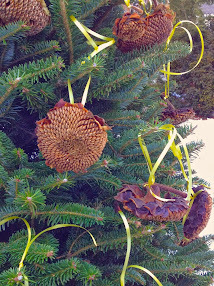 The bittersweet wreaths are decorated with festive bows, apples and feathers. I made these as a thank you gift for friends in Florida. 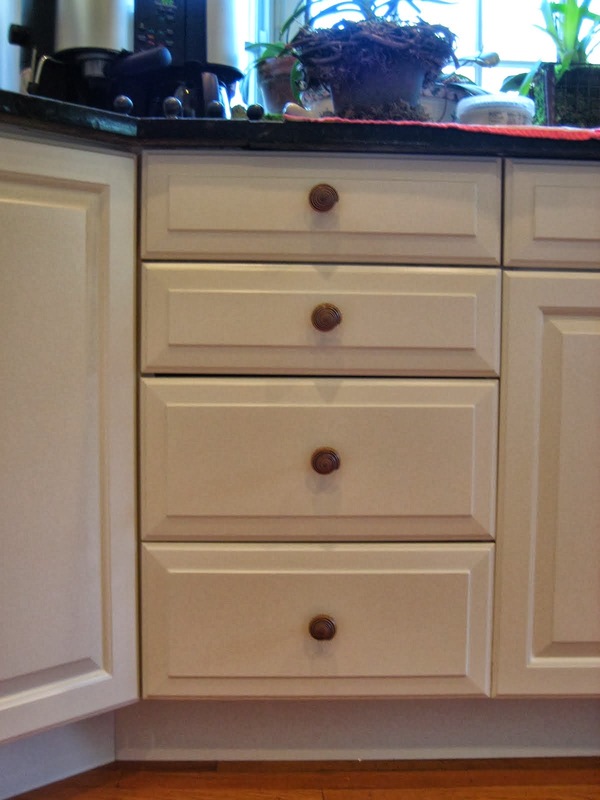 I epoxied shells onto small plain drawer knobs. The result was really nice. 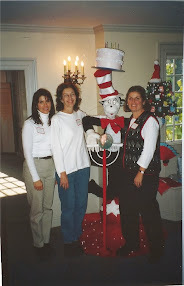 I made this Cat in the Hat with Jean Scanlon. 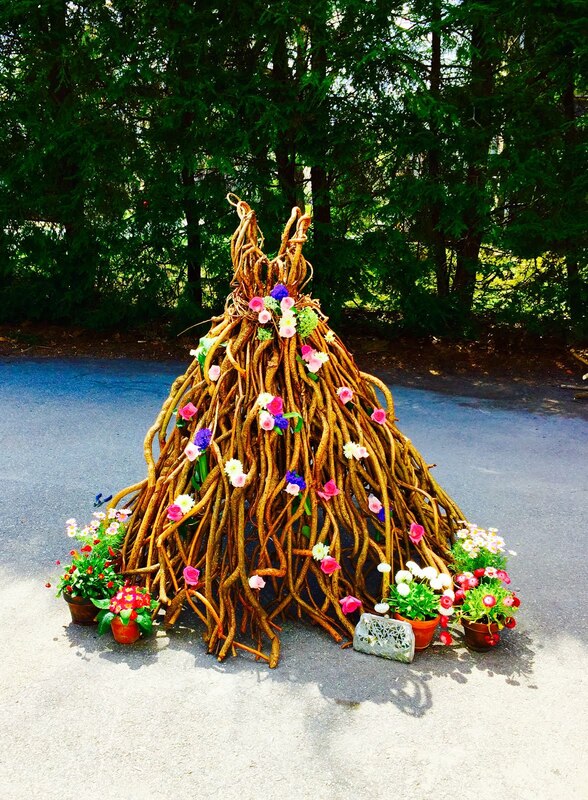 We used PVC piping, polyfill, loads of yarn, fake fur, paper mache and a lot of other materials to achieve this perfectly balanced sculpture. 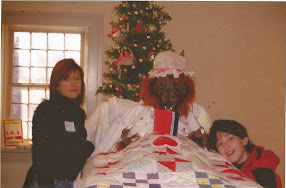 It was displayed at the Concord Museum's annual tree event. I built this for the children in my son's elementary school. It was made in the traditional native American fashion. I used long saplings, dug into the ground in a huge circle, then bent them to meet each other and lashed them together. I covered it in corn stalks,\. After days of cutting and bringing home my finds. This is what it looks like. 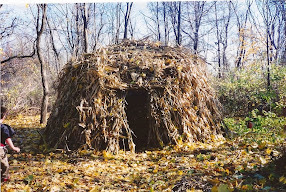 Now I must imagine a piece of furniture emerging from this "pile of sticks". For me this is where the fun begins. After rearranging these pieces of wood in every possible combination, a table emerges. The wood for this table was collected and dried for over a year. The table shows off the natural grace and form of this tree. It was stained dark walnut and has two coats of clear satin polyurethane to protect it. The top is a natural cleft blue stone. It is sealed with stone sealer to protect it from spills and other liquid damage. This corner table is a custom piece. It's graceful lines and natural cleft stone top create a beautiful elegant, rustic table. A beautiful bittersweet nest, resting on soft green moss, embrac ing spring blossoms and eggs. A hand-crafted forest like sculpture of twisted vines, roots and stone, provides a magic corner in your home for imagination. This is a live edge cherry slice, treated with a food safe finish.